The Roman Catholic Archdiocese of Saint Paul and Minneapolis (Latin: Archidioecesis Paulopolitana et Minneapolitana) is a diocese of the Catholic Church in the United States. It is led by an archbishop who administers the archdiocese from the cities of Saint Paul and Minneapolis. 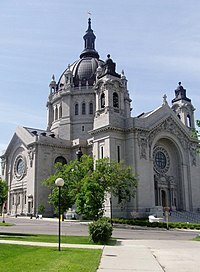 The archbishop has both a cathedral and co-cathedral: the mother church, the Cathedral of Saint Paul in Saint Paul and the co-cathedral, the Basilica of Saint Mary in Minneapolis. The archdiocese has 188 parish churches in twelve counties of Minnesota. It counts in its membership an approximate total of 750,000 people. It has two seminaries, the Saint Paul Seminary School of Divinity and Saint John Vianney College Seminary. Its official newspaper is The Catholic Spirit. The original see was canonically erected by Pope Pius IX on July 19, 1850 as the Diocese of Saint Paul of Minnesota, a suffragan episcopal see of the Archdiocese of Saint Louis. The Diocese's territory was taken from that of Dubuque, and its authority spread over all of Minnesota Territory, which consisted of the area which now composes the states of Minnesota, North Dakota and South Dakota and also comprises the modern archdiocese's ecclesiastical province. Its first Ordinary was Bishop Joseph Crétin, whose name, along with that of another notable early bishop, John Ireland, has since become embedded into the culture of the region. In February 1875 it was transferred from the ecclesiastical province of St. Louis to that of Milwaukee. Pope Leo XIII elevated the see to the rank of archdiocese on May 4, 1888 and its name was changed to reflect this. Pope Paul VI once again instituted a name change for the see on July 11, 1966. Reflecting the growth of the Catholic Church in the region, it became the Archdiocese of Saint Paul and Minneapolis, the name it retains today. Archbishop John Clayton Nienstedt, succeeded to the post on the retirement of his predecessor, Archbishop Harry Flynn, on May 2, 2008. However, in an effort to help the Archdiocese recover from criticisms he had faced for the handling of cases of sexual abuse of minors, in particular, the case of a now-laicized priest, and in the wake of unproven accusations against him that were found to not be substantial enough to proceed to trial, he resigned, along with one of his Auxiliary Bishops, Lee Piche, on June 15, 2015. Coadjutor Archbishop Bernard Hebda of Newark was named as the Apostolic Administrator of the Archdiocese by Pope Francis the same day, while retaining his other duties, until the appointment of Nienstedt's successor. On March 24, 2016, Hebda was named Archbishop. In January 2015, the archdiocese filed for bankruptcy. With the filing of bankruptcies by also the Diocese of Duluth and the Diocese of New Ulm, Minnesota set the record for having more Catholic bankruptcies than any other state in the United States of America. In February 2018 the Diocese of St Cloud became the fourth Catholic Diocese in Minnesota to announce plans file for bankruptcy. On May 31, 2018, the Archdiocese of St Paul and Minneapolis agreed to pay victims of clergy sexual abuse a total of $210 million in settlement, which now awaits court approval. By the time the settlement was issued, 91 priests who served in the Archdiocese of St Paul and Minneapolis were accused of sexually abusing 450 victims. On June 27, 2018, the Archdiocese filed for reorganization in order to find enough money to pay for the settlement. Once approved, the settlement became the second largest in any Catholic bankruptcy case in United States history and largest overall for any Archdiocese which was forced into bankruptcy. On September 21, 2018, survivors of clergy abuse officially concluded a month-long vote which resulted in the approval the settlement; the vote had started on August 21. The settlement was then approved by a U.S. Bankruptcy Court judge on September 25, 2018. On August 22, 2018, Jeff Anderson, the Ramsey County attorney who investigated the Archdiocese, called for Minnesota Governor Mark Dayton to assemble a Grand Jury investigation similar to the one conducted in Pennsylvania. The proposed grand jury investigation would include the Archdiocese of St Paul and Minneapolis and all of its five suffragan dioceses. Archbishop Hebda, Judge Tim O’Malley, director of Ministerial Standards and Safe Environment, and Tom Abood, chairman of the Archdiocesan Financial Council and the Reorganization Task Force, issued a joint statement stating that the Archdiocese "would cooperate" with a future grand jury investigation. Caroline Burns, press secretary for Governor Dayton, stated that the case was under review and that the Governor would not publicly respond until after completing this review. This is a list of the bishops who have served the Archdiocese. Diocesan map of the Province of Saint Paul and Minneapolis. ^ "Archdiocese of Saint Paul and Minneapolis". Catholic-Hierarchy.org. David M. Cheney. Retrieved 21 January 2015. ^ a b http://www.startribune.com/clergy-abuse-lawyer-will-announce-massive-settlement-in-bankruptcy-case/484187041/ Cite error: Invalid <ref> tag; name "settlement" defined multiple times with different content (see the help page). ^ Only U.S. bishop to resign and leave the priesthood in response to the encyclical of Pope Paul VI, Humanae vitae. This page was last edited on 24 March 2019, at 00:43 (UTC).